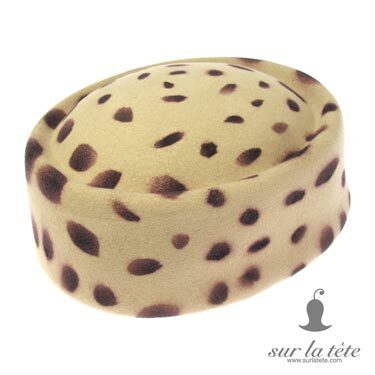 The all wool felt sur la tete Leopard Pillbox is finally here! The 2 1/2″ high pillbox will definitely add some excitement to your dressy outfit. The 100% wool-felt has a nice smooth finish. Elastic string included for ease of wear, wear along the back hairline to secure the hat on your head. Wear this hat and dance around to Beck’s “Leopard-skin pill box hat.”.